Ultra-Lite Oil-Free Moisturizer is rated 4.0 out of 5 by 10. For all skin types, especially normal to oily and acne-prone skin. A unique ultra-light oil-free gel-lotion moisturizer that leaves no stickiness or oily residue. For all skin types, especially normal to oily and acne-prone skin. 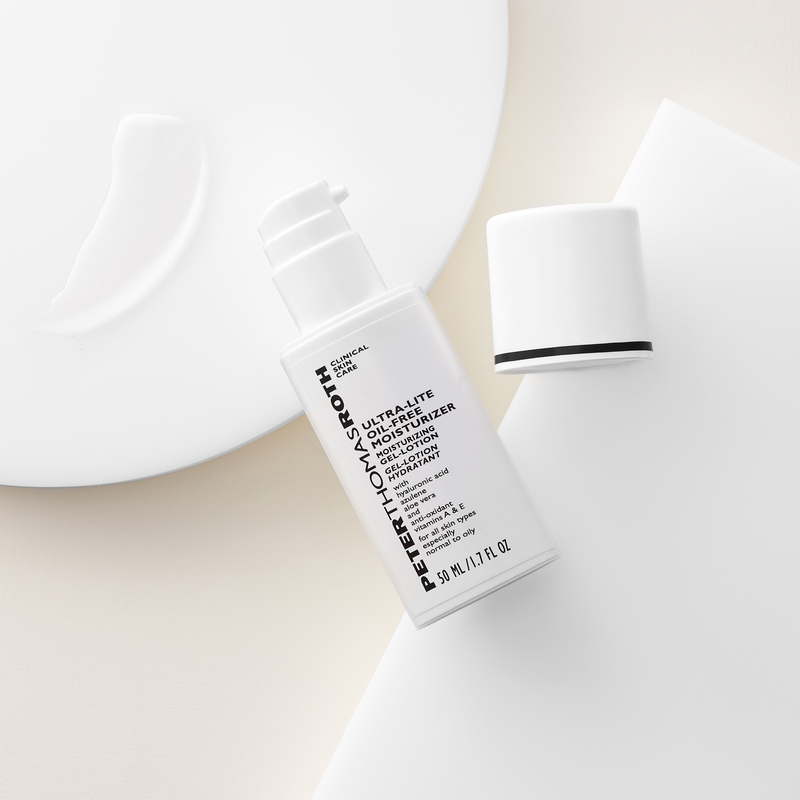 A unique ultra-light oil-free gel-lotion moisturizer that leaves no stickiness or oily residue. Helps to soothe the appearance of skin with Azulene and Aloe Vera. Vitamin E provides potent anti-oxidant benefits. Also recommended for normal to shiny skin that requires added moisture. Excellent relief for temporary dryness that accompanies acne treatment programs. Luxurious, anti-aging facial cleansing gel provides an exhilarating, peachy clean freshness to help produce a beautiful, fresh, youthful-looking complexion. Rated 5 out of 5 by Teisha from Miracle Worker! So story time, summer 2017 was really bad for me, I broke out so much there was not a clear spot of my face, just acne, blemish, scars the works. November a coworker gifted me this moisturizer, the cleanser and the travel complexion pads and said to try this and see how it works, I kid you not.. two weeks after using the products my face became less angry, less red and my acne slowly went away. My face is better now, friends and family won’t stop telling me how good my face looks, while I don’t have completely perfect skin I’m still grateful for the works it has done. THANK YOU PETER THOMAS ROTH! And my coworker ! Rated 5 out of 5 by SweetSavoryMe from Love this product My skin is very, very sensitive to fragrance, coloring, and certain ingredients. I have never had an issue with this product and it leaves my skin moisturized without it feeling greasy in any way. It is my absolute go-to lotion. I do have to say, I REALLY don't like the bottles that are used. The cap never fits on properly and I'm not crazy about the pump part. If I didn't truly love and believe in the product so much, I would have moved on to something else. Rated 5 out of 5 by PTRFan from I love it In reference to the previous review and pictures, the bottle label shows that there is 1.7FL of product in the bottle. I really like how this product works on my skin. I have oily skin and it moisturizes without being oily. I even use it under the Max Sheer sunscreen lotion on my face. Rated 5 out of 5 by maddie from Love this! This moisturizer is amazing! It's very lightweight and not oily at all! I have sensitive skin so it is perfect for that. Rated 1 out of 5 by Lori and Jane from New bottle practically empty I have a hard time reviewing this as my daughter and I spent the last hour trying to get the moisturizer out of the container. We dismantled the top and then took off the bottom to reveal how little product there was. Rated 5 out of 5 by JeniT from Going strong for a decade now I tried SO MANY face lotions, and I learned the hard way that most of them make my skin breakout. This one was FINALLY the one. I pray they never discontinue it, because nothing else has ever worked so well. LOVE IT. Rated 3 out of 5 by i183 from Good product, but.... It's a very good light moisturizer; however, last one I bought lasted me about a month. It was very unexpected since the previous one lasted for about 5 months. Had the same issue - the pump was giving me hard time so I opened the bottom and it wasn't full. Rated 5 out of 5 by Norseman19 from Excellent product Have been incorporating into my daily routine for six weeks (46 year old guy, combination/dry skin). I use the Max Sheer SPF 30 Moisturizer in the morning and follow it up with this Ultra Lite Moisturizer as needed throughout the day. Mild odor at first, but dissipates quickly. I like using SPF each morning but this complements the SPF Moisturizer well by not being as glossy. Dear Chrissy, Thank you for contacting us. We are unable to disclose the percentage of Hyaluronic Acid in this products. All ingredient are listed on the packaging. Dear Mbrittany38, This product is not fragrance-free.